I was told that the nomination came from Jennifer Feola (BLM), Tristan Huff (Oregon State University, Forestry Extension Officer Coos & Curry County) and Stuart Love (Wildlife Biologist, Oregon Department of Fish & Wildlife). I’ve worked with all three of these amazing people over the years and am so honored that they considered our ranch for the award. Over the years we have worked hard to improve the wildlife habitat here on the Chandler Ranch. We still have to log (maintenance and taxes take money, after all), but we have managed to improve conditions over the long haul. In 2010 we did a restoration of 25 acres of oak savannah (assited by a grant from ODFW). 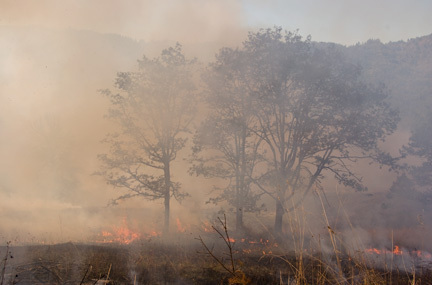 My blog post, Ground Burning of the Oak Savannah, talks about what went into it (and why we were burning). Earlier we did a restoration project of the sections of Dement Creek that run through our property. ODFW, BLM and other agencies assisted with grants for that project as well. It was before my blog (so no blog post about it), but it did significantly improve the salmon population in the mile or so of creek on our property. Overall, we’ve definitely seen an increase in wildlife on our property. 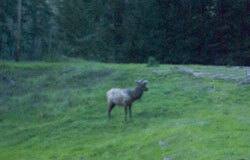 The elk herds that live on or pass through have grown – to the point where we occasionally have elk in the yard. There seem to be more deer, I’ve spotted several bears, and my daughter recently had a full-grown cougar cross the road about 20 ft. in front of her car! So, at the end of April, I’ll be honored to accept the Private Landowner Stewardship Award on behalf of the Chandler Family Ranch, LLC, at the Oregon Chapter of the Wildlife Society Annual Banquet dinner in Eugene, Oregon. We’ll get it set up! Sign me up for notifications of new blog posts. YES! I want to receive updates by email when a new post is published. New Year’s Resolutions – Check Your Labels! Why is Regulatory Compliance Important? Just to be completely up front, I get small payments when you click certain links on my site. Google Ads. My site has Google Ads on the sides and within mosts posts. If you click on one of those links, I get a small (very, very small) payment from Google. Amazon Affiliate Links. Within the text of my pages, sometimes I will recommend an item I found at Amazon. If you click that link and go to Amazon and buy something, I get a small percentage as the affiliate referred. My books are sold on Amazon, so if you click a link to buy my one of my books on Amazon, I will get a small referral fee. I am not an attorney, and so can’t offer “legal advice”. In this day and age, only an attorney can tell you whether or not you are following the law/regulations - and even then sometimes it has to be decided by a court or government official. What I have tried to do is provide is detailed information concerning existing regulations which you can use to decide what you want to do with y our labels or good manufacturing practices. Besides labeling and GMP information, I also post information about my life and travels, which is provided for general interest and amusement. Nothing on this site should be construed as advice- legal or otherwise - for your particular situation (which I know nothing about). Copyright © 2008-2018. Marie Gale.